We're always up for more The Witch and the Hundred Knight 2 trailers! As big fans of the first The Witch and the Hundred Knight, with its warped take on fairy tales and its excellent Diablo-like gameplay, we're greatly looking forward to the sequel, which promises to be a bigger and better version of the first (naturally). Related reading: Matt's review of the original on the PlayStation 4. NISA has released a new trailer for the game and, yep, it looks so, so good. Beautiful art, great twist on the Brothers Grimm-style fairy tale, the works. The trailer itself doesn't show off any gameplay, but from what we can tell, we can see that it looks set to have a richer cast, and really build on the foundations set by the original. The game's due for a 2018 release. Stay tuned - this is the beginnings of a major property for Nippon Ichi, so we can expect to see plenty more in the months ahead. World of Final Fantasy is one of the better Final Fantasy games that Square Enix has produced in quite some time. It's very, very cute, has quality Pokemon-like monster collection mechanics, and is absolutely dripping in nostalgia for people who have grown up with the series. Related reading: Matt's review of the original release on PlayStation 4. Now it's coming to PC, with a number of little enhancements for Steam users. Bonus features include: Steam Trading Cards, Steam Achievements, full keyboard and controller support. Additionally, if you buy it within the first week of release, you get some extra digital bonuses; a digital soundtrack sampler featuring tracks from the game and a wallpaper showcasing legendary Final Fantasy heroes and characters. I think the game is sadly destined to be one of the forgotten classics within the franchise, but who knows, perhaps the PC release will give it a second lease of life. If you're reading this, make sure you do play it in one form or another. It's wonderful. Ever wanted to manage a hotel where you have unlimited access to the resident's rooms, and your one job is to make them happy? Well, Happy Manager is here for you. You run a hotel which has three rather lovely ladies staying in it, and your goal is to get close to them. Yeah, it's how it sounds. The game's a D3 Publisher game, and given that that's the studio behind Zombie School Girl Shooter and the Onechanbara games, you should have all you need to know about what to expect from Happy Manager. It's going to be over the top, ridiculous, and probably very fanservicey. And also, probably a lot of fun. Sadly the game was originally going to be all in VR, but for whatever reason that feature's been dropped. The game releases with no VR support, though some limited support (likely a character model viewer) will be added in at a later date. 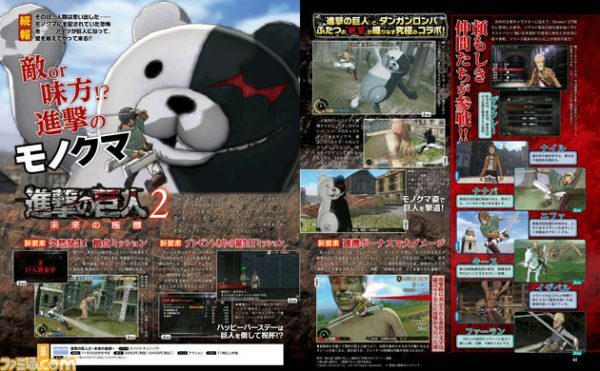 And finally, for a bit of weirdness, the delightfully psychopathic bear from the Danganronpa series has become a surprise - and welcome one - addition to the Attack on Titan 2 cast. Naturally, Monokuma is a special titan, and the most terrifying one. He'll be pulling down those walls to the city like nothing else, and good luck stopping him. Monokuma's cameo seems to be a single mission, but I'm already expecting that will be my favourite. Look out for this game in 2018 as well.